Working with virtual reality (VR) gives you the power to create entirely new environments and experiences and the ability to design every detail. Think of the opportunity to share this world you have created with others – how it would feel to design what they would see and smell? The EMC VR team was given that opportunity. They developed the virtual reality project Eden, an experience in which the player is transported into a new environment and must find both visual and olfactory clues. It was in collaboration with Alice & the Magician Aromatics, a Flavor & Fragrance company that designs and creates scents and aromatics for products and beverages. The VR team demonstrated the experience at the Burlington City Arts Center for the Burlington Book Festival on September 17th. The event celebrated storytelling and featured excellent writers, poets and performers from North America and all over the world. 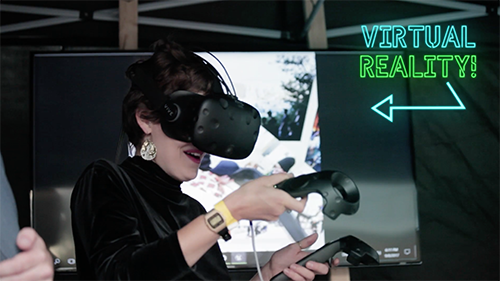 Earlier that month, the EMC demonstrated two of its virtual reality experiences: the Eden Project and the Montreal Campus Tour, at the 25th Annual South End Art Hop the weekend of September 8th. The event featured hundreds of artists, exhibits, art pieces, and more. Being the person to administer someone’s very first virtual reality experience a unique position to have, especially when you worked on the development team for the experience itself. Bringing products developed at the EMC out to the community is, as the team can attest to, very satisfying. The very quality, individuality, and intrigue of these projects garner enough pride and attention as it is, but events like Art Hop and the Burlington Book Festival allow the EMC to share it.